Shortly afterwards, taking advantage of the presence in Paris of the Galimir Quartet, the producer Canetti has proposed to Polydor that they recorded Ravel's String Quartet. He lets the composers know that he would appreciate having him come supervise the recording sessions. Fine, says Ravel, all right. Once settled in the control room, he watches the procedure without trying to direct it.He approves or not of what he hears but from a distance, occasionally saying that it's good, sometimes less so, sometimes that they must do it again. He specifies a few details, amending a slight liberty taken with a measure, correcting a tempo. After each movement, when they had played back the wax masters, they offer to do it over if he wishes, but since he doesn't wish to that much, the whole affair is wrapped up that afternoon. When they have finished, while the musicians are putting their instrumentsinto their cases before putting themselves into their coats, Ravel turns to Canetti: That was nice, he says, really nice, remind me again who the composer is. One is not obliged to believe this story. 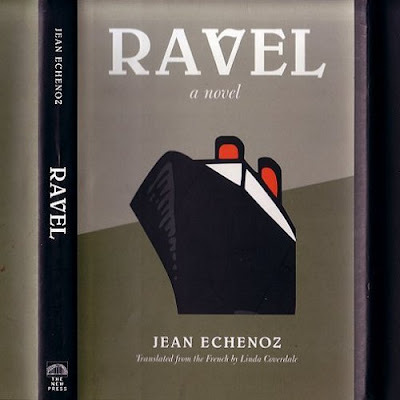 Look again at the stylish jacket of Jean Echenoz's Ravel, from which the extract above is taken. Yes, it says 'a novel'. This slim volume is a triumph of impressionist writing, with the subject being brought alive by mapping the surface rather than plumming contrived emotional depths. The style is sparse but the prose is so evocative it is easy, and arguably dangerous, to forget this is fiction rather than fact. Those two links I have inserted in the passage above, which span the infinite chasm between fiction and fact, are really quite unsettling. This work, published as part of a program providing publication assistance, received financial support from the Cultural Services of the French Embassy in the United States and the French American Cultural Exchange. Jean Echenoz's Ravel is one of the many fruits of France's benevolent attitude towards the arts. Other contemporary French authors to look out for in translation include Marie Darrieussecq, Michel Houellebecq, Tanguy Viel, Pascal Quignard and Marc Levy. Ravel by Martha Argerich here. * Talking of French culture it is good to see a new and distinctive blog from sometime Overgrown Path contributor and now Swiss resident Antoine Leboyer. Do check out Beckmesser's Rants, it is refreshingly free from the transparent off-blog agendas that are taking over more and more of the established music blogs. This post sent me straight to Amazon, thank you! I bought this novel for my (half French, on her monther's side) wife, Claire, when it came out in France, but speaking very little French myself, was not able to read it. I must admit to having totally forgotten about it until this afternoon. This gives me two evenings to finish Journey Into Fear by Eric Ambler, and it's been too long since we listened to Ravel. I will second that. To make amends I loaded Brilliant Classics's 7 CDs of the complete Ravel and Debussy piano music, played by Gordon Fergus-Thompson and Paul Crossley respectively, on my iPod before my pre-Christmas trip to France. What a delight! In fact you realy don't need anything else on your iPod.